Banstead Local History Centre is based in Banstead Library, and you can use the local history centre resources at any time that the library is open. 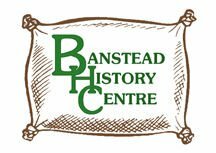 Banstead Local History Centre exists to encourage interest in local and family history in Banstead, Burgh Heath, Chipstead, Hooley, Kingswood, Lower Kingswood, Netherne-on-the-Hill, Preston, Tadworth, Tattenhams, Walton-on-the-Hill and Woodmansterne. We offer an extensive range of resources including census records, parish registers, large scale maps, directories, illustrations and photographs. We provide a microfilm and microfiche reader-printer and there is access to the internet on the library computer terminals. The centre is a partnership between Surrey Libraries, Surrey History Centre, Banstead History Research Group and other local community and history organisations.